Dark-Readers: An interview with Anne Rice and SIGNED giveaway. An interview with Anne Rice and SIGNED giveaway. Hey guys Casey here. Today I have something really special on the blog. I don't know if you're already an Anne rice fan, but the phenomenon that became 'The Vampire Chronicles' started with Interview with the Vampire in 1976, later made into a film starring Tom Cruise and Brad Pitt, and culminated with Blood Canticle in 2003. The vampire world is in crisis – their kind have been proliferating out of control and, thanks to technologies undreamed of in previous centuries, they can communicate as never before. Roused from their earth-bound slumber, ancient ones are in thrall to the Voice: which commands that they burn fledgling vampires in cities from Paris to Mumbai, Hong Kong to Kyoto and San Francisco. Immolations, huge massacres, have commenced all over the world. TODAY! Anne Rice is answering a few of our questions and we have a SIGNED GIVEAWAY for you! What was the experience of writing/publishing Interview with the Vampire? Writing the novel was intense. I sensed I'd made some sort of personal breakthrough in talking about my deepest concerns, but it was quite unexpected. I'd been trying to write pedestrian realism like so many other struggling writers, and then when I tried fantasy – a vampire telling his story – my entire emotional world and spiritual world were suddenly available to me. The publication was marvelously exciting, of course. This was a ‘first novel’ yet it made headlines. The hardcover – as it turned out – was not a great success, but the paperback launched the novel on a never-ending journey. I was grateful for all of it. The novel was controversial, as no one had seen anything quite like ‘an interview with a vampire’ before, and that added to the excitement. New ideas. New visions. New possibilities. At the time I retired from the Chronicles (2003) I really had no more to say with Lestat. I associated the Chronicles with some of the most painful parts of my life. But as the years passed, I kept thinking of Lestat, wondering what he would think about this or that cultural development, what he might have to say about this or that new film or book. He was alive for me, out there, in exile. Finally I went back and reread all of the books, and he was talking to me again, coming out of exile, out of his ‘depression’, wanting to live again. It was glorious. Much has changed in our world in the last fifteen years. But what has changed for your vampires, who have of course already lived through centuries of change? Media, communications and the internet have had a big impact on my vampires. They are confronting a world of digital phones, internet radio, satellite photography and such that they never dreamed of. For the first time in their history, they are aware of what is happening to vampires everywhere. In sum, they are feeling the impact of 24/7 news, instant photography, and internet streaming just like everybody else today. While you were writing, did your characters have anything unusual in store for you, anything delightful or troubling? Yes. I abandoned myself to the writing as I always do, welcoming detours, twists and turns, and surprises. And they did indeed come. I found that some old characters were moving towards destruction and I could not really change their fate. I fell in love with some new characters. And at least one minor character – resurrected and given a name – enchanted me. The film of Interview with the Vampire starred Tom Cruise and Brad Pitt. Who would you cast now to play your leads? Well, first let me say I loved the film. And I think Tom Cruise did a magnificent job as Lestat, and Brad Pitt did a great job as Louis. Kirsten Dunst was superb as Claudia. Antonio Banderas was an unforgettable Armand. If I were casting a new Lestat movie today, I'd look to the great British actors... Richard Armitage for instance, who would make a beautiful Lestat. He's such a fine actor. Great demeanor, face, voice. When I see him, I see Lestat. He's buried under make up in the Hobbit films. One can't even see him there. But in fact he would be superb as my hero. Matthew Macfadyen would be glorious as Marius. But then there are others – Anson Mount, Stephen Amell, Chris Hemsworth – all fine actors who would be incredible vampires. The American actor, Matt Bomer, would be a great Louis. Franҫois Arnaud would be a great vampire. Gary Oldman and Jeremy Irons, sigh! They are such greats. Surely any vampire film would be incomparably elevated by including them. The character of Armand is always a problem because he is in fact very young physically. I have not lately seen a perfect actor for Armand. As for the female vampires, Holliday Grainger would be great as Pandora. Alexandra Dowling has an otherworldly quality that makes her very beguiling. There are so many others. Oh guys! I think we can all say that we are very excited for this novel. Prince Lestat is out OCTOBER 30th so make sure you get your hands on a copy! So now for the GIVEAWAY. UK only. Competition ends 30th of October GOODLUCK! I have loved Anne Rice since I first read one of her books. I read them out of order, but still got sucked in right away! Thanks for the giveaway! It's been such a long time since I read any of the books in this series, I'm definitely due for a reread before the new book comes out! I have never read any of Anne Rice's books but I have wanted to I love vampire books! 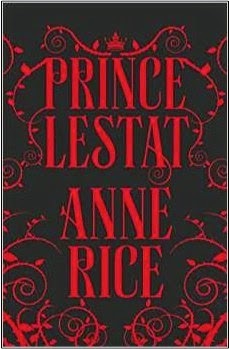 i devoured all the vampire chronicles and lamented the day i read the last word written by rice on Lestat.... it is with absolute joy and anticipation that i'm sitting waiting for this new release - to be able to continue Lester's journey with him. Brilliant! The Queen of Darkness herself! My girlfriend is still finishing up Prince Lestat—I have second dibs!